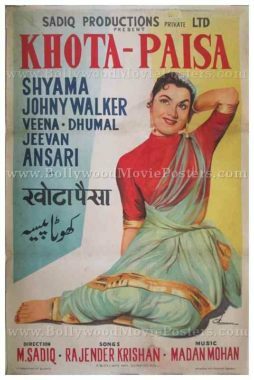 Old Bollywood movie poster of the Hindi film, Khota Paisa (1958) for sale. This is an actual surviving original vintage Bollywood movie poster of the 1958 Hindi film that featured actress Shyama in the lead role. Printed and circulated during the first release run of the film (late 1950s), this old hand painted Bollywood movie poster was originally designed for publicity of the film but never ended up being used. This vintage Bollywood movie poster features stunning hand painted artwork created by one of the most acclaimed Bollywood poster designers of his time, Deshpande. A stunning hand painted portrait of actress Shyama is seen prominently on the poster. This vintage Bollywood poster has been graded as ★★ Restored for Display primarily due to visible water stains and discoloration of the paper. Originally hand painted on canvas by Bollywood poster painter Deshpande, this vintage Bollywood poster bears his printed signature on the bottom right.